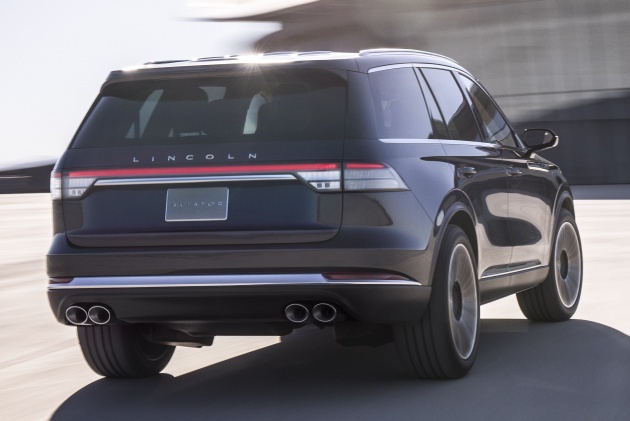 Crossovers, especially large ones with at least seven seats, are big business in America – which is why Ford’s luxury division Lincoln is giving the public a preview of its upcoming Aviator at the New York International Auto Show (NYIAS). Slotting beneath the truck-based Navigator, it’s a unibody three-row SUV that will come with a plug-in hybrid option for the first time in the brand’s history. The design of the Aviator is characterised by a character line that falls gently towards the rear, which Lincoln says emphasises the car’s rear-wheel drive architecture and is inspired by a plane wing – hence the Aviator name. The blacked-out A- and D-pillars provide a wraparound windscreen look that is again tied into the aeronautical theme. The large grille is finished in gloss black with chrome accents. Inside, the horizontal lines minimise clutter and give a spacious, airy feel to the cabin. The two-tone cabin with Shearling Beige and Lunar Grey hues is inspired by Lincoln’s more upscale Black Label models, while machined aluminium appliqués are brushed in small circles to replicate the shape of early aircraft instruments. The leather upholstery has also been minimally processed to retain its natural texture. The steering wheel is said to be “thoughtfully designed” with only subtle finger motions needed to access its functions. Available features include wireless charging and a so-called media bin in front, plus multiple power outlets and a standard-fit WiFi hotspot. There are also Perfect Position seats with 30-way power adjustment and a massage function, along with a sliding and reclining second row providing access to the third row. The production model will debut Lincoln’s Phone as a Key technology which, as the name suggests, will allow a smartphone to be used to unlock and start the car as well as to open the boot, all without a key fob. The car can be accessed through a passcode on the standard exterior keypad if the phone battery is flat, and the system can be easily deleted if the phone is lost or stolen. Although powertrain details have yet to have been released, it has been confirmed that the Aviator will come with a twin-turbocharged petrol engine, which as mentioned can be paired to a plug-in hybrid powertrain. 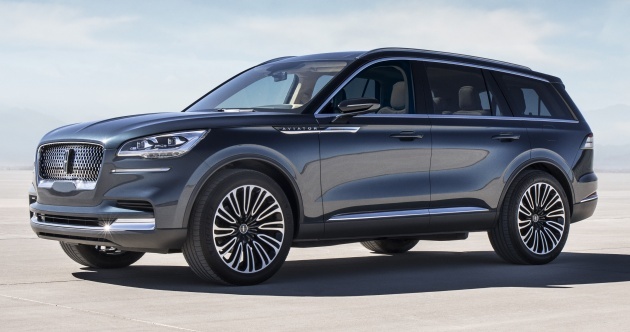 Lincoln says that the petrol-electric combination will make the Aviator “mightier than many supercars on the road today,” which sure is a mighty claim. Meanwhile, the Suspension Preview Technology uses a forward-facing camera to scan the road ahead and adjust the suspension for upcoming road conditions. Elsewhere, the Aviator receives a standard 12-inch digital instrument display, Lincoln Drive Modes, Reverse Brake Assist and the Lincoln Co-Pilot360 suite of driver assists that include automatic emergency braking with pedestrian detection, blind spot information system with cross-traffic alert, lane keeping system, a reverse camera and auto high-beam lighting. Owners will be able to use their smartphone as a key when Lincoln debuts the Phone as a Key technology on the production model of Aviator, allowing clients to lock and unlock the vehicle, open its trunk and, most importantly, start and drive it – no smart key fob necessary. Ranieri: “Why not?”. Just b4 winning EPL. Lincoln!! Shut up & take my money now! Ok everyone sit down… I want the Aviator design to take the cue from the F BMW 7 series and throw in the Jaguar grill while you are at it. VOILA !! Absolutely stunning, Lincoln has come out of the shadows once again. 7 seater is important in Malaysia too. Hopefully Boyue comes with 7 seats. Otherwise sure to fail. Why CRV and CX5 do very well despite only 5 seater….well the name Honda and Mazda overides all other considerations. The land currently occupied by Proton in Shah Alam, which totals 250 acres, will be transferred back to DRB-Hicom. Proton, 49.99% owned by Geely will fully relocate to Tanjung Malim within the next 5 years. Ha ha ha ha. There is no such thing as a FREE lunch bro. I only know Vagrant are given free meal at night in Masjid Jamek area in KL.